Light your home using the same amount of light for less money. According to the Department of Energy, replacing your home’s five most frequently used light fixtures or bulbs with models that have earned the ENERGY STAR, you can save $75 each year. New lighting standards took effect in 2012, and money-saving options such as halogen incandescent, CFL, and LED light bulbs are available today. For high-quality products with the greatest energy savings, choose bulbs that have earned the ENERGY STAR. Traditional incandescent bulbs use a lot of energy to produce light and are no longer manufactured. Newer energy-saving light bulbs provide the choices in colors and light levels you’ve come to expect. The new lights are also much more efficient — so they save you money. Three of the most common energy-efficient lighting types include halogen incandescent, CFLs, and LEDs. You can find these in most hardware and home improvement stores. Halogen incandescent bulbs have a capsule inside that holds gas around a filament to increase bulb efficiency. They are available in a wide range of shapes and colors, and they can be used with dimmers. Halogen incandescent bulbs meet the federal minimum energy efficiency standard, but there are now many more efficient options to meet your lighting needs. 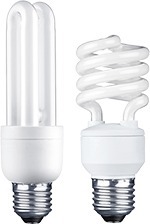 CFLs are simply curly versions of the long tube fluorescent lights you may already have in a kitchen or garage. Because they use less electricity than traditional incandescent bulbs, typical CFLs can pay for themselves in less than nine months, and then start saving you money each month. An ENERGY STAR-qualified CFL uses about one-fourth the energy and lasts ten times longer than a comparable traditional incandescent bulb that puts out the same amount of light. A CFL uses about one-third the energy of a halogen incandescent. CFL bulbs are available in a rand of light colors, including warm (white to yellow) tones that were not as available when first introduced. Some are encased in a cover to further diffuse the light and provide a similar shape to the bulbs you are replacing. If you are looking for a dimmable bulb, check the package to make sure you purchase a CFL with that feature. Fluorescent bulbs contain a small amount of mercury, and they should always be recycled at the end of their lifespan. Many retailers recycle CFLs for free. LEDs are a type of solid-state lighting — semiconductors that convert electricity into light. Although once known mainly for indicator and traffic lights, LEDs in white light, general illumination applications are one of today’s most energy-efficient and rapidly-developing technologies. ENERGY STAR-qualified LEDs use only 20%-25% of the energy and last up to 25 times longer than the traditional incandescent bulbs they replace. LEDs use 25%-30% of the energy and last 8-25 times longer than halogen incandescent bulbs. 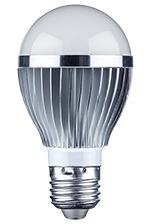 LED bulbs are currently available in many products such as replacements for 40W, 60W, and 75W traditional incandescent bulbs, reflector bulbs often used in recessed fixtures, and small track lights. While LEDs are more expensive at this early stage, they still save money because they last a long time and have very low energy use. As with other electronics, prices are expected to come down as more products enter the market.